This Sláinte wall hanging features a knot-work motif that includes Celtic birds that represented the messengers between the other word in ancient lore. 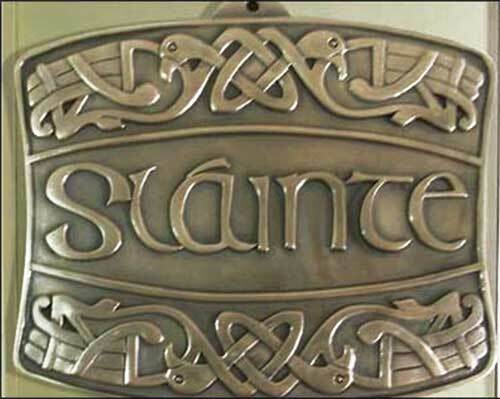 Sláinte is an Irish blessing of good health in the Gaelic language and it is also a popular Irish drinking toast meaning cheers. 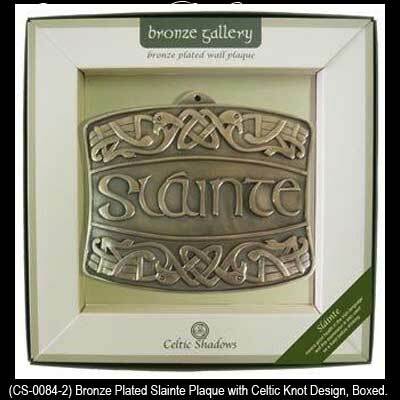 Made of hand crafted, cold cast bronze plated construction this Sláinte plaque measures 6" wide x 5 1/2" high x 1/2" deep and has a dimensional design that is ready to hang on your wall. It will look ideal in your Irish pub, man cave or home.